Image: Matt Petit/Disney Parks via Getty Images. It’s finally happening! On Wednesday, stars of the smash-hit Disney animated film Frozen gave fans just a little taste of the highly-anticipated sequel. 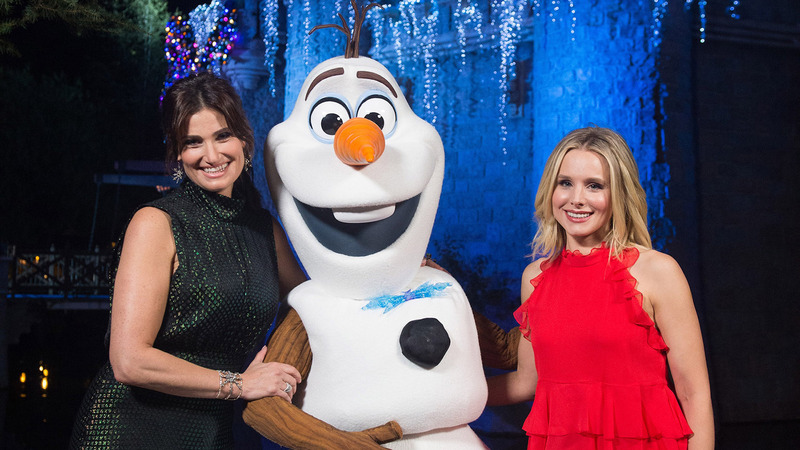 Idina Menzel and Josh Gad posted behind-the-scenes photos from Frozen 2 on Instagram, featuring some familiar faces: theirs, plus Kristen Bell, Jonathan Groff… and Sven, the cartoon moose from the first movie. “Soon enough…” Gad, who voiced the snowman Olaf, captioned a photo of himself, Menzel, Bell and Groff cuddling up to a plush Sven doll. As noted by E! News, Gad tagged Santino Fontana, who is not pictured, but who did voice the character Hans in the first movie. Whether or not Fontana will reprise his role in the sequel is unclear, but that’s not the weirdest tagging choice in Gad’s photo. In addition to tagging his fellow costars in the photo, Gad also tagged Dwayne Johnson, who was not in the first Frozen film. Per Instagram’s tagging system, users can choose where to put their tags, much like on Facebook. Johnson’s tag overlays the Sven plushie, which leaves us with some burning questions. Will Johnson join the cast of Frozen 2, alongside newcomers Sterling K. Brown and Evan Rachel Wood? Will he voice Sven, who doesn’t speak at all in the first film? There have been no reports of Johnson adding his voice to this chorus, but we must admit we’d be here for it if he did. Meanwhile, Menzel’s photo of the cast does not feature the Sven doll, nor did she tag anyone who isn’t actually pictured. “Just a little morning Arendellian love,” she wrote, referencing the fictional land that her character Elsa reigns over in Frozen. Thus far, these photos are our first look at the filming process for Frozen 2, though the film is slated to hit theaters in November of this year.